Jet Airways, which has 123 planes, was once India's biggest private airline, but reports say that just five planes have been in use. The Indian government had asked state-run banks to step in with a bailout plan for the airline - which employs 23,000 people and was founded by Naresh Goyal more than 25 years ago. He stepped down as chairman last month. "Late last night, Jet Airways was informed by the State Bank of India (SBI), on behalf of the consortium of Indian lenders, that they are unable to consider its request for critical interim funding," the airline said. "Since no emergency funding from the lenders or any other source is forthcoming, the airline will not be able to pay for fuel or other critical services to keep the operations going. Consequently, with immediate effect, Jet Airways is compelled to cancel all its international and domestic flights. The last flight will operate today," it added. Jet's last flight before the suspension departed from Amritsar and as the flight took off the brightness of the iconic Golden Temple was visible through the night sky. It was an emotional last journey for the crew and even for the ground staff. "The sun will rise again," the pilot told me before he took charge. He had worked for the airline for 17 years and was hopeful of reprieve. 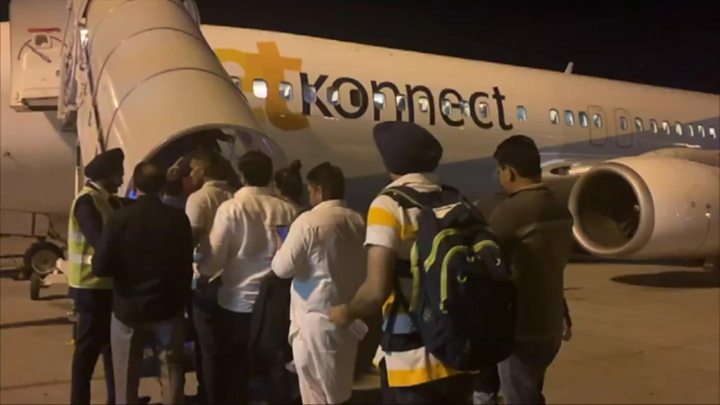 Many people didn't even bother turning up for the flight, mistakenly believing this would be cancelled too but for those who did make it on board there was a palpable sense of community and concern for the staff of Jet Airways. Image caption Ground staff prepare for Jet Airways last flight, departing from Amritsar to Mumbai and Delhi. Passengers asked cabin crew what was to happen to their jobs, where they would go from here. There have been no clear answers for Jet staff - and many felt a deal would come through, but worry was nevertheless etched on their faces. Many were asking questions about their onward journeys and felt frustration at the state of India's airline industry, remembering the fate of Kingfisher Airlines. Yet others booked tickets on this particular flight just to make history. Before the flight touched down, the pilot spoke a few optimistic words to the passengers telling them this may be the last flight for now, but he very much hoped they would fly Jet once again. "Jet Airways is hopeful that it will be able to bring the joy of flying back to its guests as soon as possible," the airline said. The carrier operated 600 domestic and 380 international routes, including out of London, Amsterdam and Paris, and had grown rapidly before it started to lose market share after the entry of low-cost airlines like IndiGo & SpiceJet. The UK's Civil Aviation Authority tweeted advice to customers, outlining different approaches for seeking refunds depending on how the flight was booked. We are aware that #JetAirways has suspended all flights today. "In parallel, the airline's management and its key stakeholders including its consortium of lenders, continue to work closely towards resolving the current situation," a spokesman had said. "The airline regrets the inconvenience caused to its guests," they added.